16th Ankara Jazz Festival will host many successful guitar players in accordance with its theme of this year: The Dance of the Jazz with the Guitar. We will be able to listen to the guitar almost in every concert of the festival. This instrument will sometimes be at the center of the bands playing jazz , will sometimes accompany to the jazz vocalists. We will also feel ethnic winds and able to hear many popular tunes from guitars. The festival will even be colored by fretless guitar and oud in some concerts. We will listen to one of the best orchestras in Turkey, Türk Armoni Yıldızları accompanying to Melis Sökmen at vocal on February 1st. The concert will be performed at ODTÜ KKM (Middle East Technical University - Cultural and Conventional Center) I should add that the guitar player Hasan Murat Aran is a member of the orchestra. On February 2nd, Jülide Özçelik will be listened by audience of the festival again at ODTÜ KKM. Jülide Özçelik is certainly one of the most popular jazz singers of Turkey in recent years. In my opinion, her Jazz Istanbul albums including many Turkish Music tunes have a considerable effect on that. Her performances in İstanbul are generally early sold out. As a rare situation, some pieces in some performances are sung with the audience all together. I've been observing that Ankara would like to see a Jülide Özçelik performance very much for a long time. For the performance, Jülide Özçelik will be accompanied by Cem Tuncer on guitar, Kağan Yıldız on bass, (they both were at the two albums), Ercüment Orkut on piano and Alpdoğan Türeci on drums. One of the performances that I am looking forward to listening will be presented by Bora Çeliker Quartet on February 6th in Türk Amerikan Derneği. I should mention that one of the best drummers in Turkey Ferit Odman, pianist Burak Bedikyan and bassist Matt Hall will play with Bora Çeliker in this concert. Bora Çeliker has recently released his album Borabook including many genres such as jazz, blues and psychedelic, which is the main reason for my curiosity. You may listen to Alp Bora Quartet, who are Alp Bora on guitar and vocal, Julia Pichler on violin, Lukas Lauermann on violoncello and Soner Tezcan on percussion at ODTÜ KKM A Hall on February 7 . They have been performing together and introducing Turkish tunes to the world for a long time. It's a good opportunity for you to listen to Alp Bora and his band which is located in Vienna. 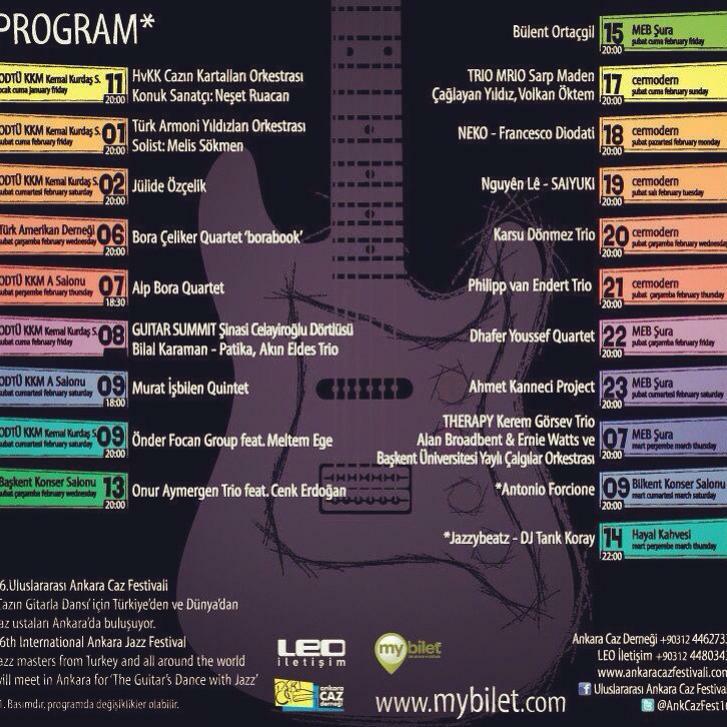 When we reach February 8th we will be able to experience a Guitar Summit night at again ODTÜ KKM. There will be three concerts following each other. First we will listen to Şinasi Celayiroğlu and his band. Koray Ergünay will be on bass, Kuzey Yılmaz will be on drums, Gökhan Över will be on rhodes and Sinem Yılmaz İslamoğlu on vocal for this concert. Later on we will see Bilal Karaman and his trio with his new album Patika. Bilal Karaman has performed with Marcus Miller and Lars Danielsson at last İstanbul Jazz Festival and gain a good reputation around İstanbul Jazz Scene. He is among the musts of such a guitar specific festival. The end of the night will be with Akın Eldes, the unique sound of the guitar in Turkey. Thanks to his own albums of genres jazz , fusion and rock-jazz he caught an authentic style. He is also performing with Telvin of fretless guitar master Erkan Oğur. Bassist Çağlayan Yıldız and drummer Cem Aksel will accompany Akın Eldes for the performance. You can listen to Murat İşbilen Quintet on Februray 9th once again at ODTÜ KKM A Hall. The band is generally performing Turkish folk tunes as well as some ethnic and world music pieces. They also sometimes use Murat İşbilen's compositions. Guitarist Güray Demir, violonist Gülçin Keskin, bassist Hasan Aldemir and percussionist Serdar Güzeliş will play together with guitarist Guitarist Murat İşbilen on this evening. Following Murat İşbilen Quintet concert in A Hall of ODTÜ KKM, the audience of Ankara Jazz Festival will listen to Önder Focan Band with Meltem Ege on February 9th. If we say that Önder Focan is one of the best jazz guitarist in Turkey, this description become a certainly inadequate one. He is one of the most important jazz people in Turkey, considering his albums with young talents, his international performances and the support of them to Turkish Jazz Scene with his wife Zuhal Focan. Meltem Ege is the best jazz vocal of the capital Ankara. She has been performing after her graduation from Berklee and working as a teacher in Başkent University. She has lately released her first album including some good compositions that they performed together with Önder Focan, Ferit Odman, Ozan Musluoğlu and Şenova Ülker last year. The feedbacks to the album is good enough in our country. As far as we have learned, there will be three sets. Firstly a trio configuration of Önder Focan, Ferit Odman and Ozan Musluoğlu will take place on the stage. Then, trombonist Bulut Gülen (whose name is heard in İstanbul nowadays) and one of the best trumpeter of Turkey, Şenova Ülker will join the band. They will perform some pieces of a good album of Öncer Focan, 36 mm Biometric. For the last set, the vocalist Meltem Ege will join the others to sing some pieces from her album Songbook. We will listen to Onur Aymergen Trio (Onur Aymergen-guitar, Akın Bağcıoğlu-drums and Orhan Deniz-bass) with one of the best fretless guitar players in Turkey Cenk Erdoğan on February 13th in Başkent Konser Salonu. We have listened to Onur Aymergen Trio before again in Ankara Jazz Festival. Their visual shows were remarkable as well as musical performances. We have heard that they have caught a good harmony together for this concert. The audience will be able to listen to Bülent Ortaçgil at Meb Şura Salonu on February 15th. Valuable Turkish jazz musicians, Baki Duyarlar (p), Gürol Ağırbaş (b) and Cem Aksel (d) will accompany him. One of my another favorite performance will be on February 17th at CerModern and will be played by Trio Mrio. 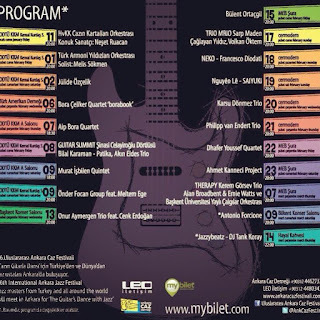 3 good musicians are playing in Trio Mrio: famous guitarist Sarp Maden, one of the most important music people of Turkey, guitarist and bassist Çağlayan Yıldız and technically perfect drummer Volkan Öktem. The band is originally found in trio formation in 1997 with these names. Later on we saw Alp Ersönmez on the bass for a while. After Genco Arı is joined to the band on the piano, Trio Mrio has changed into Quartet Muartet. As you may understand from the names the festival performance will be given by the initial band. We will start to see international names in the 16th Ankara Jazz Festival with February 18th. Firstly Italian Francesco Diodati and his quartet NEKO will be at Cer Modern. The guitarist Francesco Diodati has been affected by folk and modern rock as well as mainstream jazz. His first album is released in Auand label with the name Purple Bra. The musician has performed with many famous jazz musicians in well known festivals. I think, Enrico Rava and Avishai Cohen are the most famous ones. Francesco Diodati will be accompanied by Francesco Ponticelli on double bass, Francesco Bigoni on tenor saxophone and Ermano Baron on drums. Cer Modern will host a very important guitar player, Nguyen Le on February 19th. He is among the best contemporary fusion guitarists of the world. Although he is born in Paris, originating from Vietnam, some of his works are affected from ethnic music. His performances are unique since he merges ethnic to rock and rock to jazz at the same time. Nguyen Le has accomplished many works together with many important musicians all around the world since his first appearance in 1983 with Afro-Caribbean band Ultramarine and being a part of French National Jazz Orchestra later on. Kudsi Ergüner is among these musicians. I should add that he has become the first ACT musician and recorded more than 10 albums from ACT after he has joined to Jazzpana- Ensemble in 1993. I was planning to listen to him last October in ACT Jubilee Night in İstanbul. However due to some problems in schedule Johan Norberg attended the concert instead of him. It was my destiny to listen to him in Ankara. They will perform Saiyuki (an ACT album) with the album band: Mieko Miyazaki koto and vocal, Prabhu Edouard is tabla, percussion and vocal. The Turkish composer, singer and pianist Karsu Dönmez who lives in Holland will be with Ankara Jazz Festival Audience on February 20th at Cer Modern. Although she has been composing and performing for a long time her album Confession could just be released. She has performed in North Sea Jazz Festival as well as in İstanbul Jazz Festival. We will experience German Philipp van Endert Trio on February 21st again at Cer Modern. Phlip van Endert is a melodic and lyrical guitar player. Their last album Rosebud has been well criticized all around the world and also honored by guest appearance of jazz musician Nick Margitza. There is Elvis Presley's Can’t Help Falling in Love composition as well as You Must Believe in Spring of Bill Evans in the album. The band is: Philipp van Endert on guitar, Andre Nendza on acoustic bass and Kurt Billker on drums. Dhafer Youssef Quartet concert that wll be held on February 20th at Meb Şura Salonu will be one of the most important performance of the festival this year in my opinion. Dhaffer Youssef, who impressed the İstanbul audience deeply in last jazz festival with his vocal and oud, is among the most important ethnic musicians of the world considering his authentic touch to the instrument. Although he is born in Tunisia he is living in Europe (by saying that he feel himself more relaxed in there). He was able to work with Renaud Garcia Fons in his first Vienna days. Later on, he could perform with Markus Stockhausen and Dieter Ilg. He has also performed with many Nordic musicians. Nils Peter Molvaer and Bugge Wesseltoft are just few of them. Dhafer Youssef will be accompanied by Khrisjan Randalu(piano) and Phil Donkin(double bass) and Chander Sardjoe(drums). I don't think there is anyone in Turkey interested in classical guitar and have not heard about Ahmet Kanneci. He is the one that accomplished the best works in this genre. Since he is from Ankara, we can usually listen to him here. However, when the case is that he will play jazz for us then this concert on February 23th at Meb Şura Salonu, suddenly become an interesting one. As far as we have learned, the performance will cover pieces from Bach to Livaneli and Shostakovic to Bollani and there will be some readings as well as poems with themes such as Life, Death and Freedom. I can't find anything to explain, because the performance does not look like anything I have seen before. Let's go and listen to our virtuoso. The first concert of the festival in March may be one of the most important ones and will be held on March 7th at Meb Şura Salonu. We will listen to Kerem Görsev's and his trio's (Ferit Odman on drums, Kağan Yıldız on double bass) Therapy album that is recorded in Abbey Road Studios in 2010 with companionship of London Philharmonia Orchestra conducted by Alan Broadbent and famous saxophonist Ernie Watts. The Good news: Alan Broadbent and Ernie Watts will be with us. The album is certainly a very good international album. I feel very lucky to be able to listen to that in Ankara. We will listen to Başkent Üniversitesi Yaylı Çalgılar Orkestrası as the orchestra. Another performance in March will be Antonio Forcione's in March 9th at Bilkent Concert Hall. Antonio Forcione is one of the best acoustic guitar players of the world in related genres. He is born in Italy but lives in London nowadays. We are talking about a musician that has released more than 20 albums in his name and worked with many different kind of musicians all around the world. You can hear flamenco, jazz, Africa or even India in Forcione's works. Whatever he plays, who you see at the stage is a charismatic virtuoso catching the audience by his energy transfer and control. I am sure that this interesting guitarist will affect you deeply. Let me remind you that he has also worked with Erkan Oğur. I have met Antonio Forcione in last Fringe Festival of Edinburgh after a great concert of his latest album Sketches of Africa. It was a fantastic concert. He will most probably play this album with the band in the album for our festival. The festival will end on March 14 by a closing party at Ankara Hayal Kahvesi. In addition to the above concerts the festival attendees will be able to see jam sessions in Samm's Bistro on February 1st, 8th, 15th and 22nd. Lastly, I would like to express some of my opinions about Ankara Jazz Festival. I think there is an organic relationship between festivals organised in the city, live performance halls in the city, number of good musicians living in the city, the style of the city, sponsors, number of qualified listeners and the idea of the government towards to the art and music. You can easily see that each of these components affects each other. For instance, there is a necessity of a dedicated jazz club in Ankara which should keep the temperature of the jazz audience high that can also invite international names. However, the owner candidates of such places are worried about whether the place will be full or any sponsorship can be found. At first sight, the problems seem to be solved by enough numbers of interested music listeners however many listeners are complaining about high ticket prices, poor festival programs, poor organizations and poor advertising. These problems are started to be overcame in İstanbul one by one. The development in İstanbul about sponsorship, musicians, clubs and festivals are remarkable. Considering also that the acoustic music is demanded more in last years in Turkey, I think Ankara should get what it deserves. Honestly, I should also say that there are counteraction against those improvements which are closing radios and television programs about jazz and similar genres by governmental foundations. There are many good things about Ankara Jazz Festival this year: The concerts are announced early and the tickets are good-priced (almost cheap). I also liked the short notes about the musicians in the ticket sales webpage. The long term period of the festival is also useful for the city to live with jazz. I recommend you to have a look at the program and buy the tickets from My Bilet till they are sold out. Do not forget that the demand will mean a bigger sponsor and a bigger sponsor will mean a better program. The world will be a better place just by art and music. My articles will continue with each concert.